Rejoice, Rejoice! Again I say Rejoice! Let us take these words to heart and gather this week to wrap the Christmas gifts we have purchased for the joy of the children of Avondale ! If you can, Bring wrapping paper, scissors, scotch tape. If you don’t have such supplies on hand, come and we will share with those who can bring them. On Friday morning, 9:30, help load up your car, and take gifts to the children K-5 at Avondale Elementary School…Rejoice in the Gift of Giving! and give us the gift of believing You are with us through this difficult and confusing time. Help us keep balance and peace within ourselves. We pray never to forget what You have taught us is most important. Come Together and Celebrate the Spirit of Thanksgiving in prayer, community, song, for all good Gifts & Blessings! Students of the respective faith traditions will respond to Faith Leaders. Please Bring Gift Offerings of warm socks, hats, blankets, gloves, tents, triple A batteries for the Homeless living on our streets, in camps, under the bridges. Offerings will be received and distributed by Mr. Ben Sears and Staff of Street Medicine Outreach. In addition, Tori DeAnni, volunteer R.N. for the Village Mountain Mission in Dominican Republic has asked us if we would bring small toys and baby items for the children she serves. Monetary donations to Red Cross are much needed. Retreat with Spirituality & Balance! Stay at the Red Roof Inn from Friday Eve 7:00 p.m. to Sunday at 11:00 a.m.
pray, play, share stories of faith. 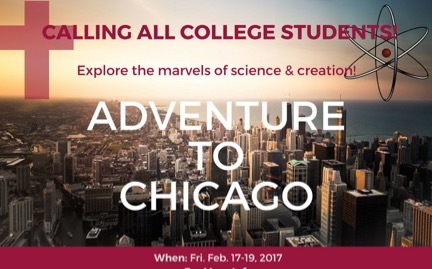 Join in with other downtown students on an adventure of a lifetime to Washington, D.C.! Have a great time together celebrating a year of hard academic work! Visit the Smithsonian and other D.C. sites. ~Cost: $350. $50 due February 26th to reserve airline ticket. Space is limited. Sign up right away. Eight students from both Campuses-- Columbus and Lancaster are taking off for Chicago—a wonderful town—on Friday morning February 19th to enjoy a weekend retreat with students on campuses from Illinois, Michigan, Indiana, Ohio. The theme centers around music and how it has always been integral to the spiritual life. “When it comes to music, we have a lot to offer each other and a lot to offer the world.” Professionals from Music that Makes Community will lead us in song, prayer, worship, fun, community. The students will be staying at the comfortable Hosteling International Chicago in downtown. And of course all will take time to visit Chicago sites and ride the metro and have some famous Chicago Deep Dish Pizza! Dr. Ellen O’Shaughnessy, Campus Minister, and her husband named by the students as Dr. Bob, will be chaperones. The retreat is made possible by grants to the Downtowners Campus Ministry. —only an hour and twenty minutes northeast of Columbus off route 62.
visit Amish country, take a skiing/sledding trip to Snow Trails, less than an hour away. Sleeping accommodations in cabins are warm and comfortable. For the nature walk, bring warm clothes and warm shoes. Bring a blanket, pillow, sheets and/or sleeping bag, towel and washcloth. Share you favorite relaxing music, favorite games. Choose a spiritual reading or passage from the Bible that is meaningful to you. The cost is only $25 because the retreat is underwritten by donations given to the Downtowners Campus Ministry. The address for Pilgrim Hills is 33833 Township Road 20, Brinkhaven, Ohio 43006. Google also calls it Gann, Ohio. Follow 62 into Danville. Continue on 62 northeast about eight miles to Route 206. Turn right, south, and go two miles to the Pilgrim Hills sign and turn right. The entrance is one mile down TWP Rd 20 on the left. The sign for Pilgrim Hills is on the right. Ignore any turns prior to 206 even if your navigational system tells you to do it. Dr. O is renting a van. Call her if you need a ride. Let’s carpool!